The following story was originally performed live as part of KPCC's live storytelling series, Unheard LA. Each show features a curated lineup of real people sharing true stories of life here in Southern California. You can RSVP for the next show here. I live in Koreatown. Or as I tell real estate snobs, "Beverly Hills Adjacent Adjacent Adjacent." I first learned of Koreatown in 1992, when news footage of the LA Riots lit up my family's television screen in our San Francisco home. During that harrowing week in 1992, I watched the explosive failure of people who weren't able to "just get along" across racial differences literally playing out in a national state of emergency. It was the last place I ever imagined that I'd buy my first home. Fast forward to 2010 when I purchased a modest condo in Koreatown because it was one of the few centrally located L.A. neighborhoods that I could forgo car ownership and therefore afford a mortgage on an artist's income. What Koreatown lacked in green space, it made up for in amazing walkability. But despite the neighborhood's overabundance of 24-hour food and underground karaoke, the one thing I couldn't find was a place to exercise within walking distance from my home. The one, clear option was the 24 Hour Fitness on Wilshire Boulevard. But I'm not a fan of gym equipment or high membership dues. I'm the kind of gal who can exercise only if held captive by a yoga teacher or aerobics instructor in the company of other women who also think walking on a treadmill alone for arbitrary stretches of time feels too existential. For two years, I got my workout on as a Groupon floozy, busing to downtown L.A. for whatever fitness craze offered an introductory, one-month, half-price deal, trying out the newest yoga meets ballet meets kickboxing meets Hollywood striptease workout trend, feigning interest in continued commitment, before moving on to the next faraway fitness fad studio's introductory offering. It was tedious and time consuming to spend that much time getting to my cheap workout by bus. Finding affordable fitness right in my neighborhood, however, remained impossible. Then one Monday night while I was walking down to a bus stop on Pico Boulevard, I heard Latin music blasting through a blown-out speaker from inside, of all places, a Cash4Gold storefront. In the same place you could sell your gold for quick cash were dozens of women gyrating to Latin pop music. Somehow this shady business in the middle of a strip mall was not a front for drugs or gambling but... a rogue Zumba studio? I returned the next day in workout clothes, slipped three, crumpled $1 bills to a woman behind bulletproof glass, then joined neighbors I'd never met in a fat-burning, cardio-pulsing, aerobic workout. I had finally found it! A workout within walking distance! It was not part of a corporation. It wasn't underwritten by a nonprofit community health initiative. This studio was underwritten by the will of the people! This was grassroots fitness organizing: a people of color, community health space; a guerilla action against the overwhelming density of cities! I had found a fitness gold mine! For an hour, on those concrete floors, we merengue marched, salsa traveled, and Destroza'd together. What was the profit model here? I tried not to multiply the number of students in the class by $3, subtract the costs of the teacher, rent, and insurance. Was there insurance here? I tried not to think too hard about why a lone set of tire rims, four pairs of sneakers, and a knock-off Juicy purse were perpetually for sale in the corner of the studio. Instead, for an hour a day, I spent quality time with my neighbors who I would otherwise never talk to — not that we did much talking. 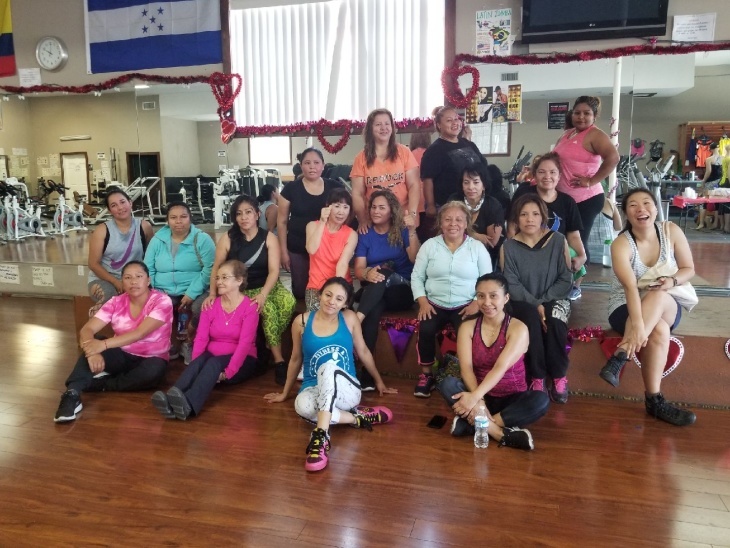 With the exception of me using basic, high school Spanish to greet them, we spent the hour moving, sweating, and smiling as we got fit together. Then, one day, without warning, the Cash4Gold storefront closed up, taking the possibly illegal Zumba studio with it and leaving me on the hunt for a new place to work out. I roamed the streets of Koreatown, listening for the sound of crackling Samba music at 9 a.m. and looking for homemade poster board signs in Spanish taped to windows of storefronts that looked like they were between leases. My detective work paid off when I found a secret Zumba studio on Third Street and Alexandria Avenue, carved out of a former clothing store. It housed a pile of decapitated mannequins still laying fresh in the corner, while we did reggaeton steps to a speaker set on the floor. That studio only stayed open for month. I briefly found another one around the corner that was even smaller: an old toy store the size of my bedroom. The going price? Always $3. Always cash only. Always on the brink of closure. It was there that my fellow Zumba students told me about a gym on Pico Boulevard that offered Zumba classes. One said she'd seen but couldn't remember the name. I couldn't find it on Yelp, so I went walking one morning following the stray details I had: It was on Pico near Oxford Avenue. Look for weights and a nice floor. I found it sandwiched by a jukebox repair store that was always closed and a printing shop I had never seen anyone go into. Fitness and Beyond was a small gym owned by a mother-daughter team with no showers, but lots of room to Zumba in. Like before, Zumba was only $3. Cash only. In the beginning, I was often the lone Asian face in Zumba class, but Korean women are showing up more and more. I wonder how they stumble upon what feels like a secret of the neighborhood. Once, when I was the only Asian in the class, Psy's Gangnam Style was playing and an entire class turned their heads 240 degrees to look at me. I smiled and nodded knowingly, as if this song from my assumed homeland (I'm actually Chinese) had made me feel that much more welcome. It was a little strange, but very sweet. 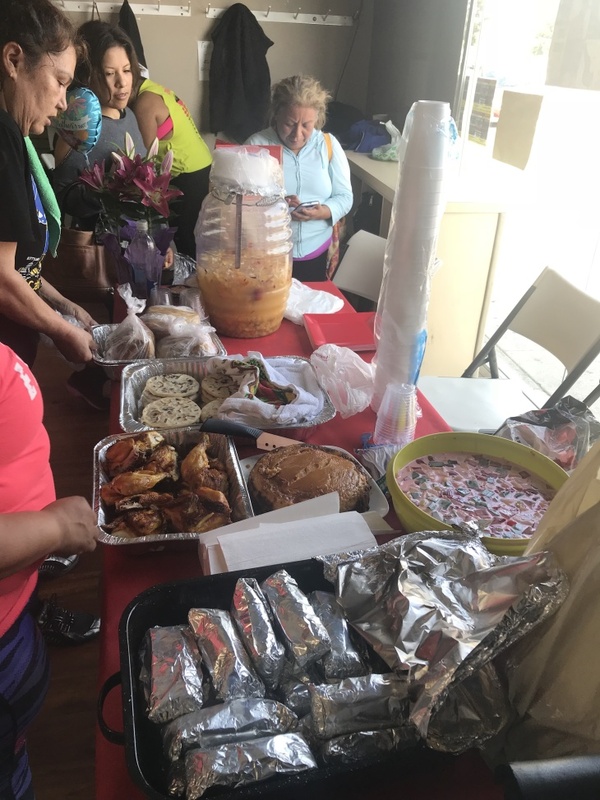 During holidays, my Zumba studio has potlucks. People bring pupusas, Korean noodles, and doughnuts. I can kind of follow the conversations in Spanish more than I totally can't in Korean. Still, it's nice to eat with everyone. Are we some kind of racial utopia? Not exactly. But they are my neighbors. They are my morning family in Los Angeles. They are the community I fought so hard to find. In a neighborhood that's constantly changing, we are literally keeping each other healthy. Kristina Wong is a performance artist, comedian. She has been a resident of Koreatown since 2010. Her newest project is "Kristina Wong for Public Office," a performance art piece and real-life campaign for public office. Interested in sharing your story? Fill out the form below. We read every submission and look forward to being in touch.